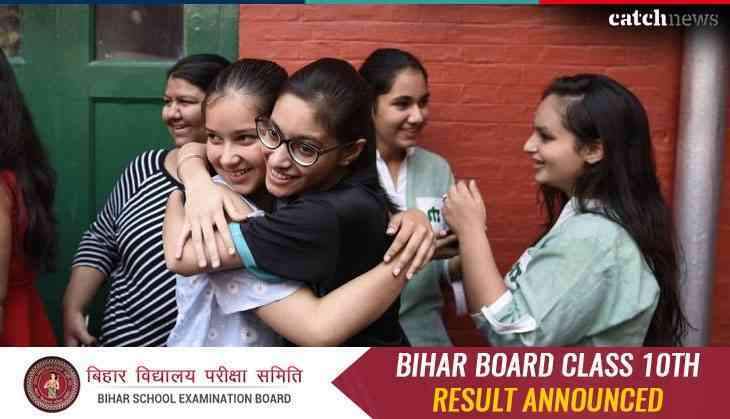 The Bihar School Examination Board (BSEB) has announced the results for Bihar Board Class 10th results on the official website today. Total of 17.58 lakh students are appeared for matric exams in which 12.11 students have passed. As per girls- boys ratio in which 8.84 lakh boys and 8.74 lakh girls appeared for their matric exams, of which, 12.11 lakh passed. A total of 12.23 lakh boys and 65,779 girls have got first division while 3.67 lakh boys and 2.95 lakh girls have got the second division. While 1.75 lakh males and 1.81 lakh females have got the third division, approx 1304 students have got a compartment. The matric result were announced by the Bihar Education Minister Krishna Nandan Prasad Verma, Chairman Anand Kishor and Principal Secretary R K Mahajan. Prerna Raj has topped the exam with 91.4 per cent while the second position is jointly shared by Pragya and Shikha Kumari. The third rank is bagged by Anupriya Kumari who scored 452 marks. This year 68.89% have passed the exam a with a rise of 18.77% from the previous year.